Hon. 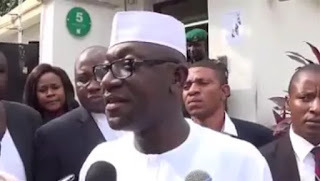 Abdulmumin Jibrin, (the suspended member of the House of Repon) on Friday called for ‘negotiated exit’ of President Muhammadu Buhari from office. He also noted that the President obviously has an health challenge which he must urgently attend to. “The president I see on camera needs full home care not office, moderately quiet life, enough rest and quality time with his family. Previous articleAGAIN!!! THE GOSPEL OF THE RESTORATION OF THE KINGDOM OF HEAVEN ON EARTH IS BACK TO YOU AGAIN.